Our Spilsby shop said a very sad goodbye to the shop manager Sherryl on Thursday 31st January. 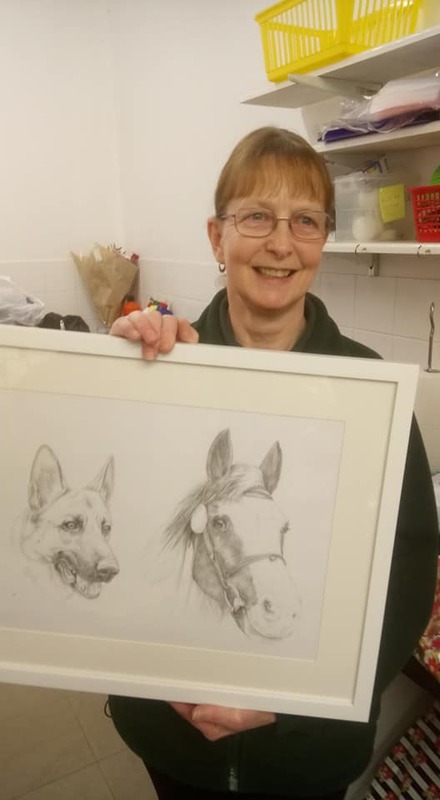 Fen Bank staff, volunteers and customers had a collection and bought her leaving presents which included portraits of her beloved dog and horse (pictured above). Sherryl has done a wonderful job of running things at Spilsby and all at Fen Bank extend our thanks to her for her hard work. The shop is however being left in good hands. Bev Millard has been appointed the new manager. Bev has worked at the shop with Sherryl as a volunteer for some time so is already well known to staff and customers. Good luck to both Sherryl and Bev.